When I think of our compassionate listening I sense a leaning in – as if from the heart center – toward whomever I’m listening to. I am close – literally or metaphorically – to our guest and yet there is room for whatever arises. Kind of paradoxical. There is both closeness and space for our guest whether we ‘like’ what they are sharing or not. It is what it is and we are compassionate in the midst of it. With all these years of listening service under out belt, it is clear that we are passionate about listening. I experience passion as something I am delighted by and motivated to pursue. So what is the relationship of passion to compassion? The prefix ‘com’ means ‘with’ so compassion means ‘with passion.’ At first glance, that doesn’t make sense. Interestingly enough ‘passion’ means ‘to suffer.’ To suffer implies that a situation or condition has befallen us beyond our own choosing. Chorus: It is what it is. All of us suffer the bad situations as well as the good situations. With this understanding, passionate people are not particularly special and they don’t even choose their pursuits. Their passion befalls them beyond their choosing. 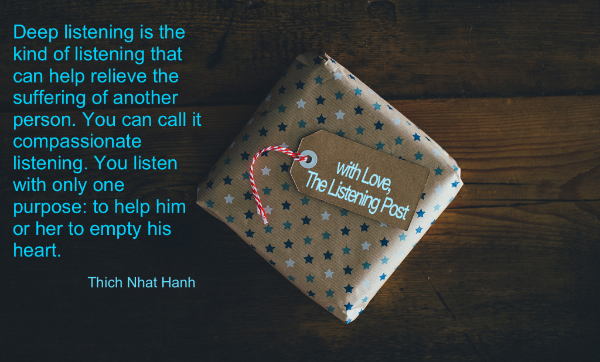 Passionate listeners cannot be made (though I still believe that everyone can learn to listen better) and we, as compassionate listeners, are allowing what is when we are available to be with suffering all that befalls ourselves and another. It is what it is, may we suffer the grace and space to listen to it all – especially in this season of presence and giving.